This macro allows to automatically run specified macro with every rebuild operation using SOLIDWORKS API. 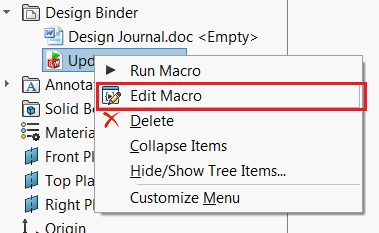 Macro feature is inserted to the macro as the last feature in the tree. When model is rebuilt (either on demand or automatically) macro will be automatically run. By default macro feature and a macro are embedded into the model. 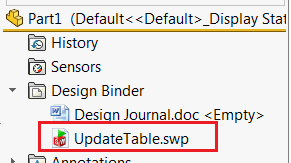 That means that the model can be opened and will be updated on any other workstation which doesn’t have this macro available. This can be also embedded directly to the document template. Const BASE_NAME As String = "[Name of Feature]"
Const BASE_NAME As String = "MacroRunner"
Const PARAM_MACRO_NAME As String = "MacroName"
Const PARAM_MACRO_MODULE_NAME As String = "MacroModuleName"
Const PARAM_MACRO_PROC_NAME As String = "MacroProcName"
MsgBox "Failed to insert macro attachment"
GetMacroEntryPoint swApp, curMacroPath, moduleName, ""
vMethods(0) = curMacroPath: vMethods(1) = moduleName: vMethods(2) = "swmRebuild"
vMethods(3) = curMacroPath: vMethods(4) = moduleName: vMethods(5) = "swmEditDefinition"
vMethods(6) = curMacroPath: vMethods(7) = moduleName: vMethods(8) = "swmSecurity"
MsgBox "Failed to create macro runner"